Petzel Gallery is pleased to announce a new exhibition of works by Maria Lassnig entitled Woman Power: Maria Lassnig in New York 1968–1980. 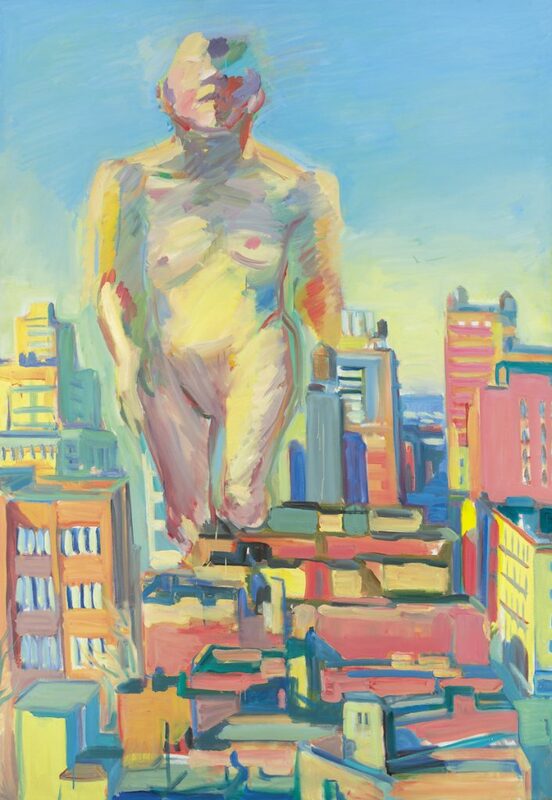 In 1968 at age 49, the painter Maria Lassnig moved from her residence in Paris to New York City to be in, as she called it, “the country of strong women” (1). 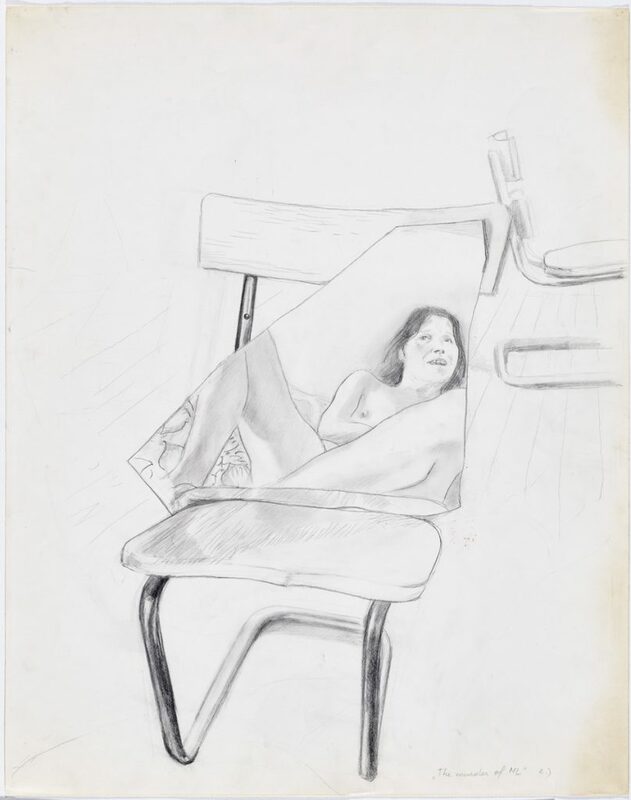 Although well known in her native Austria, Lassnig was virtually unheard of in the States and lived, for the next 12 years, in relative anonymity renting walk-ups in the Lower East Side and Soho. According to those who knew her, she felt an affinity with the city; loved its constant activity, dynamism and the sense of freedom it engendered. New York City offered Lassnig a liberation of sorts from the male-dominated art scene of Europe; it gave her the opportunity to be an artist, not simply a female artist—and she worked prolifically, producing paintings, drawings, watercolors, silkscreen prints and animated films, often including hints of Americana in her work. Lassnig’s New York years were an incredibly formative time for the artist, a period in which she further developed her singular “body sensation” or “body awareness” aesthetic of the late 1940s. “Die Beute” (1972) and “Selbstportraet als Indianergirl” (1973) are indicative of this technique, using sensations of the body as conduits to envision the external world, a unique practice among artists at that time. 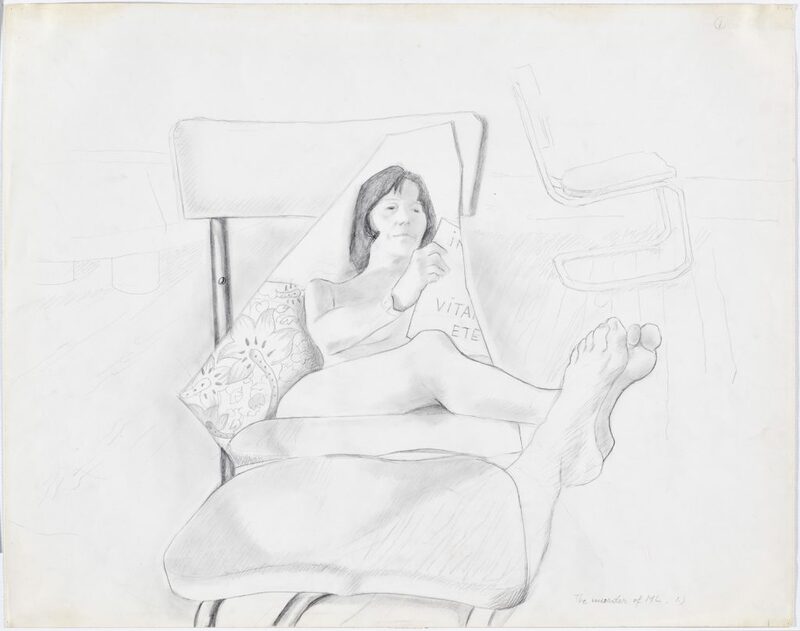 Other paintings in this show, including a wonderful suite of pencil drawings exemplify how Lassnig also turned toward realism identified with self-portraiture. These four drawings can also be seen sequentially as a story-board, reflecting how the artistic freedom Lassnig enjoyed in the city allowed her to experiment in other art forms including film. She studied animated film at the School of Visual Arts in the early 1970s and in 1974 she became part of the Women/Artist/Filmmakers, Inc., a non-profit group, founded to support independent filmmakers. The exhibition will also devote an evening, on September 22nd, to screening a selection of shorts by members of the Women/Artist/Filmmakers, Inc. including a recently restored work of Maria’s as well as films by Silvianna Goldsmith, Rosalind Schneider, Carolee Schneemann, and Martha Nilsson Edelheit. 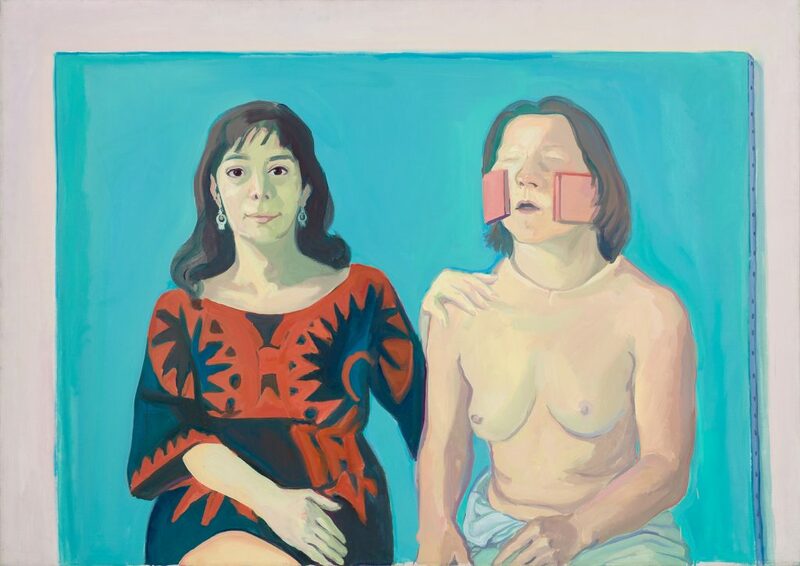 The exhibition Woman Power: Maria Lassnig in New York 1968–1980 brings together eight paintings, seven watercolors and nearly twenty drawings Lassnig made during her residence in New York City from 1968–1980. The mostly green-tinted paintings, document herself as well as her close friends, such as Iris and Silvia (Silvianna Goldsmith a founder of the Women/Artist/Filmmakers, Inc.). 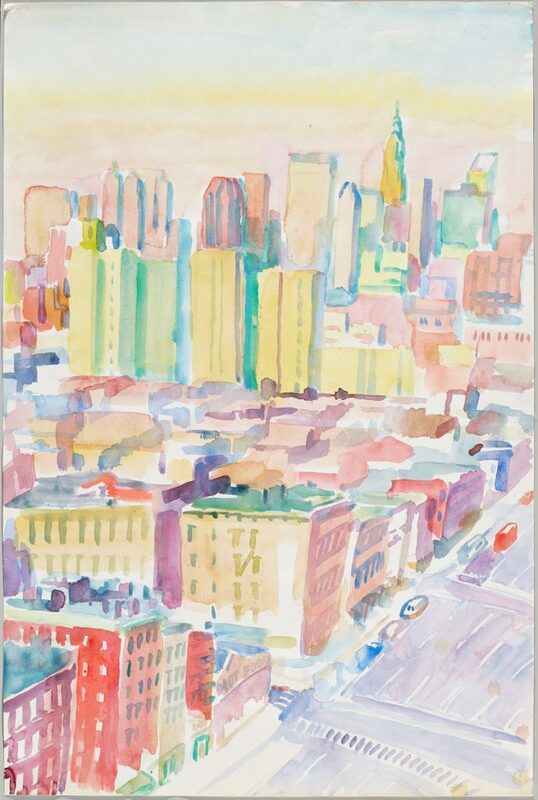 The watercolors depict views of city’s skylines while her pencil drawings capture the people she knew and her surroundings. (1) Maria Lassnig, The Pen is the Sister of the Brush: Diaries 1943-1997, ed. Hans Ulrich Obrist (Göttingen: Steidl Hauser & Wirth, 2009). Oil on canvas, 49.61 x 70.08 inches, 126 x 178 cm, on back “Selbstportraet mit Silvi”. © Maria Lassnig Foundation, photo: Roland Krauss. Titled lower right “The murder of ML. 1. )”; in center “IN[…] VITA[…] ETE[…]”; upper, right “1 Ge[…]”. © Maria Lassnig Foundation, photo: Roland Krauss. Oil on canvas, 47.24 x 51.18 inches, 120 x 130 cm, on back “M. Lassnig 1972”. © Maria Lassnig Foundation, photo: Roland Krauss. Pencil on paper, 28.54 x 22.44 inches, 72.5 x 57 cm Titled lower right “‘The murder of ML’ 2. )” © Maria Lassnig Foundation, photo: Roland Krauss. 71.65 x 49.61 inches, 182 x 126 cm. 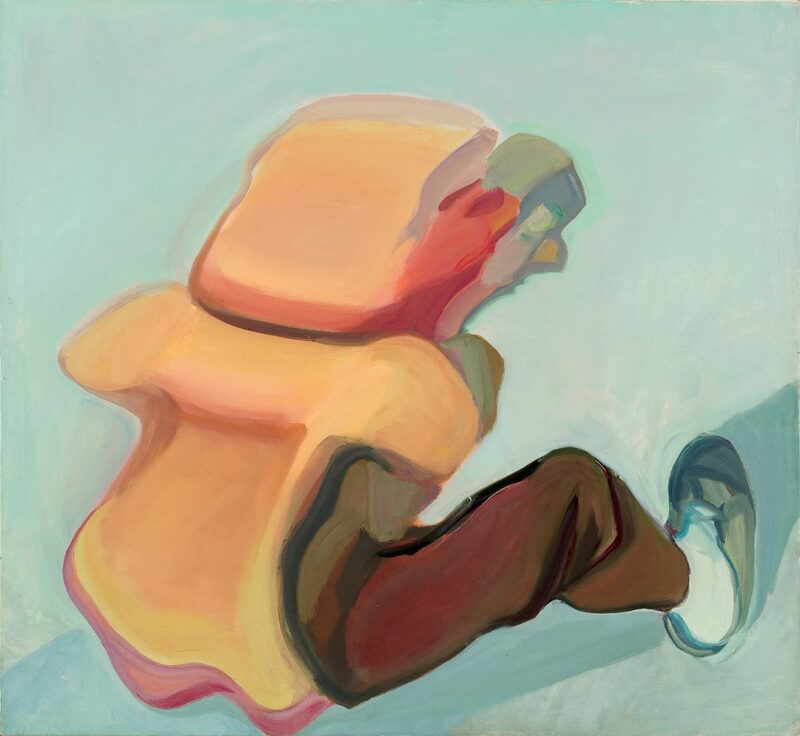 © Maria Lassnig Foundation / The Essl Collection, Klosterneuburg / Vienna. Water color on paper, 18.86 x 23.94 inches, 47.9 x 60.8 cm. © Maria Lassnig Foundation, photo: Roland Krauss.